Any individual carrying on a business on his/her own behalf will be a sole trader. Sole-traders are self-employed and pay income tax as well as Medisave on the profits made by the business. Sole Proprietorship is suitable option for any small business. 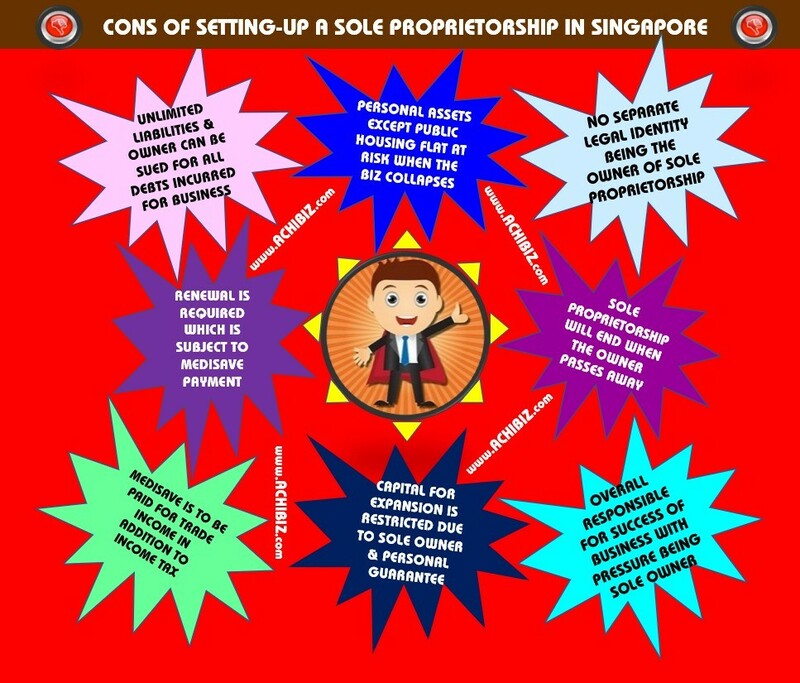 After appointing Singapore Citizen or Singapore Permanent Resident as the manager, a foreign company or a foreign individual can also be registered as a Sole Proprietor in Singapore. It is an easy procedure to register a sole-proprietorship. It is easy and quick to start trading as a sole trader as there are no formalities to comply with other than notifying the Tax Authorities. All the profits generated by the business will belong to the sole-trader. Sole-traders own their business and so are able to sell or transfer the business assets & liabilities as they wish. One of the advantages of this form of business is that there are fewer formalities in terms of its formation and registration. Pay income tax for your trade income at individual income tax rate. CPF contribution is not mandatory. Due to flexible structure it’s easy to convert into Partnership just by adding another person as a Partner. A sole-trader has unlimited liability. This means that if the business should collapse, the sole-trader could loose not only the cash and other assets invested in the business but all his/her personal assets as well excluding HDB flat, to meet the debts of the business. A sole-proprietorship is a business firm owned by one person or one locally incorporated company. There are no partners. The sole-proprietor has absolute say in the running of the business firm. Management rests on that one person and his liability is unlimited. There is no requirement for a sole-trader to maintain accounts for auditing purposes however the records shall be kept for five years. For tax purposes, a balance sheet or statement of affairs as at the end of the year and a detailed profit and loss account must be submitted to the tax authorities. If such a business fails or is declared bankrupt, the creditors can sue the proprietor for all debts incurred. A legal claim can be made against the personal assets of the proprietor. Sole Proprietor could not transfer the ownership of Firm however the assets & liabilities of the Firm could be easily transferred to another person.